The Melo 3 – Typically, the first movie of a trifecta series is recognized as the best one hands down. Riding off the success of the first movie, they put out a sequel, everyone spends money to see it and it’s a disappointment. Then they go for the moon on the third and final iteration, fixing the mistakes from the second but trying to improve on the first. It ordinarily turns out better than expected, besides the Fast and Furious franchise. The Eleaf Mel0 3 tank is not like a trifecta movie series however, but the analogy fits… hang with me a bit and I’ll walk you through you it. Eleaf has been around for years and have a reputation of releasing great, affordable products for the masses. Ladies and gentlemen, the Melo 3 is here and it’s exquisitely well-made! Just observing the quality and craftsmanship, you can gauge right away this device is going to look great on any mod you attach it to! 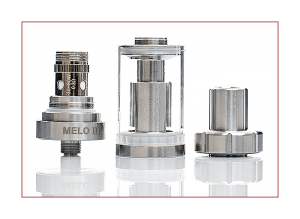 The precise machining, buttery smooth threads, hidden airflow that actually functions well and superb materials set the eLeaf Melo 3 apart from its competitors. But it leaks. 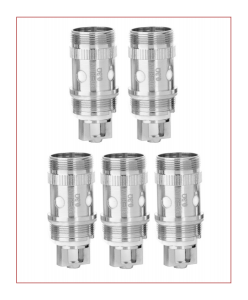 The Melo 3 Sub-Ohm Tank (my version of what MELO stands for is Massive eJuice Leak Operation) is made out of 304 Stainless Steel from top to bottom and is available in Black or the color I received, Stainless Steel. The glass is 1.5mm thick and feels abnormally beefy for only a 22mm tank. Filling the 4ml of eJuice capacity through two juice fill slots under the top cap equates to an easy top fill system. Eleaf added some nice knurling on the top cap for easy removal. There’s also a thick O-ring inside the top cap to really get a tight seal down on the glass section and minimize any juice from building up under the drip tip. It also does a good job on limiting condensation buildup through the drip tip. Threads are machined perfectly with no squeaks or lock ups when tightening or loosening both ends of the tank. So far so good. The chimney section is one solid piece, unlike a lot of tanks that have a two-piece chimney that unscrews into separate pieces. The glass just slides right over it and the O-rings create a nice seal. 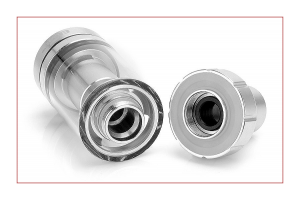 The 510-compatible drip tip has a Stainless Steel exterior and is Delrin-lined to help dissipate some heat and does a perfect job doing just that! I love the drip tip and I’ve been using it on most of my other Sub-Ohm Tanks! 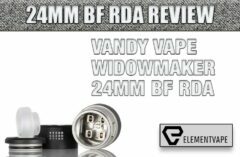 With a 12.5mm outside and 7.5mm inside diameter, it feels strong and comfortable while vaping. Conveniently, the tank is 510 compatible so you could use your own drip tips if you’d like. Did I mention, it leaks! Adjusting the two 13.5mm hidden airflow slots is a pain. I wish Eleaf would’ve included some knurling or grooves like they did on the top cap with the airflow control ring. Every time I close the airflow to refill my eJuice, I end up loosening the atomizer from the device. Then I’ll try to retighten it back down, and because of the hidden airflow feature, I end up just opening the airflow again. A back and forth game of which of ‘one can I get to work first’. It’s easy to accomplish this when the tank is off the mod but one hundred percent inconvenient. It’s a shame because the hidden airflow feature really gives the atomizer a super sleek appearance. I can almost look past the adjustment issue because the airflow is nice and airy but with a slight restrictiveness that I really prefer. Not too airy, not too tight but just perfectly balanced. Now, on to the most impressive feature with the eLeaf Melo 3, the amount of wattage this tank can handle without overheating! The 0.5Ω EC coil heads can run at 100watts without a dry hit or the drip tip getting overly hot! I was shocked to see this small Dual Vertical Kanthal coil pushing 100 watts, wicking was doing its job and the flavor was just fantastic! A 0.3ohm EC coil head rated to 80 watts is also included and performs equally great. Very little break-in time is needed for both of coils. I enjoy pushing all of my coils, tanks and mods to their limit to see what can handle the abuse and what taps out early. This coil is not big by any means. 4mm inner diameter coil with four 2.5mm wicking holes, this thing is ridiculously powerful for its size. Like seeing a Honda Civic with a 454 Big Block hiding under the hood! In other words, I’d call this a sleeper coil because it does and will surprise you! 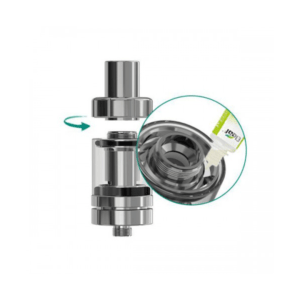 The coil is not the problem; it’s the tank that loves to leak! Right around 75 watts is a really great, warm flavorful vape. Chain vaping at this wattage, the eLeaf Melo 3 glass section and base stay warm to the touch and the insulated drip tip does its job regulating the heat away from my lips. Sitting idle, you’re going to get some gurgling but I never experienced any spit back. Atlantis, Triton and cCell coils are all compatible with the Melo 3. Eleaf includes two extra sets of colored O-rings, Clear and Magenta in the box. After an hour or so feeling really impressed with the tank, I start to see juice building up in the airflow slots… and the leaking commences! That was disappointing considering I was just vaping this around 85W and was blown away by the performance. Maybe I pushed it too hard and it started to leak. But the recommended wattage was 100W so I’m not exactly sure what went wrong! The leaking issue with the eLeaf Melo 3 progressively got worse. I took the tank apart and observed the coil to see if there were any noticeable defects but everything seemed to be intact. I cleaned the tank, installed the coil back in but was running into the same leaking issue. Even dropping the wattage to well under 50W didn’t seem to make much of a difference. I’m getting used to vaping at higher wattages, so taking long, intense puffs is the norm for me. 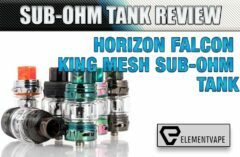 Most Sub-Ohm Tank coils can handle this stress and won’t leak especially when they’re rated at such high wattages. So I installed the 0.3Ω coil to see if my luck would improve. The 0.3Ω coil held up when taking easier pulls but as soon as I started taking deeper Direct Lung hits, I experienced leaking from the air slots again! It wasn’t immediately after filling it. Once the cotton was fully saturated, doing anything more than a nice and easy puff resulted in gurgling and juice filling the airflow holes. If I tilted the tank, it didn’t pour out excessively but it definitely dribbled down the side onto my device. Once I noticed the juice filling up the base, I would take a couple pulls and it would temporarily go away. Sure enough, another strong hit and I’d see the juice appearing again. I made sure to close the airflow before refilling, which is a common mistake a beginner makes which will cause the tank to leak. When this happens with not one but two coils in the same day, it’s definitely a problem, and a disappointing one for me. If you’re an easy going vaper and don’t take huge, violent hits on your devices, you might not ever experience the same dilemma I do. So to conclude, the coils held up fine but the tank couldn’t hold up to the abuse. After taking everything apart and cleaning it for the second time, I replaced the O-rings thinking that could’ve been the problem. So far so good! I installed the 0.3Ω coil back in, kept my wattage under 50W and I haven’t had any leaking issues, as of yet. 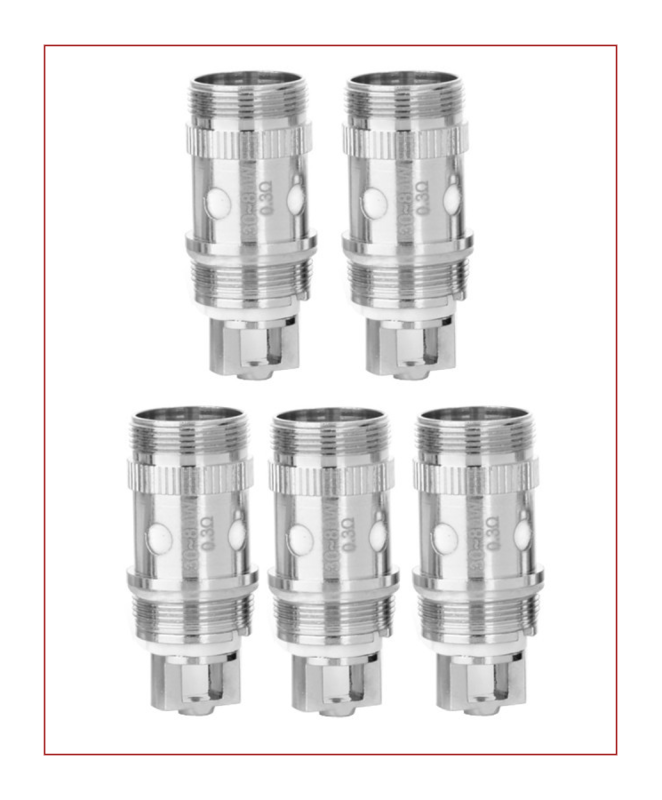 The benefit of this tank is it’s cross-compatible with the Atlantis, Triton and cCell coils so hopefully my experience will improve with these additional options. 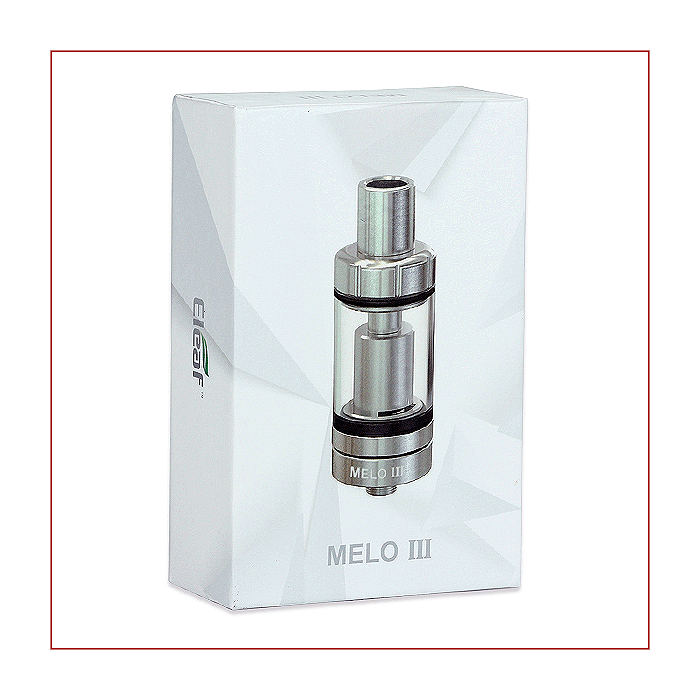 The eLeaf Melo 3 is a beautifully crafted tank! Don’t get me wrong, it’s one of the sleekest, shiniest tanks I’ve came across. The short amount of time I was able to get a nice vape without it leaking was great! It produces fantastic flavor with zero cotton break-in time. After a couple puffs the flavor was coming through great and got better and more flavorful with higher wattages. But I have to lean back on the fact it leaked on me, not once or twice, but rather a few different times. 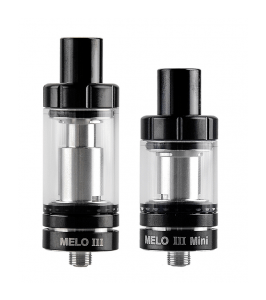 It doesn’t matter how good the coils are in the short term or if the O-rings that were preinstalled were faulty, the eLeaf Melo 3 is still a product that was messy to deal with. Overall, the eLeaf Melo 3 is an average tank. 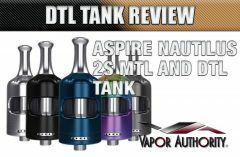 The aesthetics and feel of the tank are top-notch, the performance was good in the short term, but you have to keep it mind that it might leak. That brings into question the quality of materials used and if the longevity of the tank will be good or if it’ll be just another shelf sitter. The price is very acceptable at around $25, but is it worth it? Not in my opinion. Hopefully trying other coils will result in a better experience, but only time will tell. If you own the eLeaf Melo 3 and have tried it with compatible coils, especially the Vaporesso cCell, I’d love to hear about your experience in the comments below.